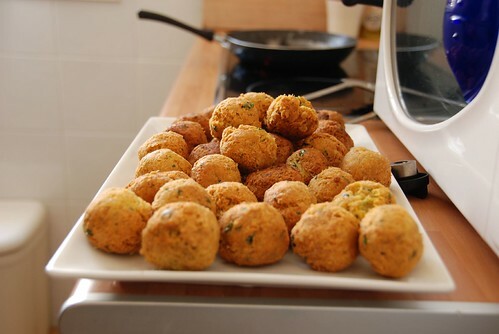 These are photos taken by XosÃ© Castro of Spanish foods. 9962 views since February 01, 2009. Spain: Eggplant tempura with honey and balsamic vinegar and "straw" fried potatoes. A typical Spanish dish (but we don't call it "tempura"). 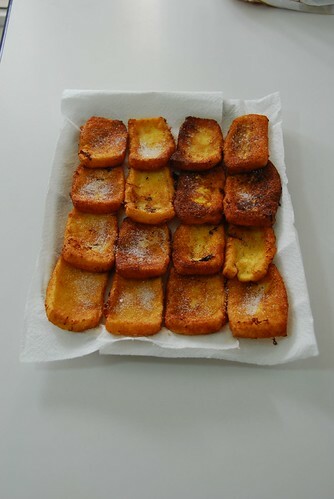 Berenjenas rebozadas con patatas paja, miel y una reducciï¿½n de vinagre balsï¿½mico. Restaurante El tendido, en el barrio de Argï¿½elles de Madrid. 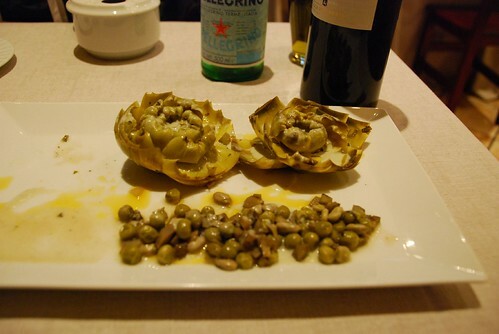 In Spain we usually have salad as a side order. Salad is not a starter but something you share and eat while you enjoy your main plate. This is a homemade lettuce, mozzarella, ruccola, raisins, and tomato salad dressed with virgin olive oil, Maldon salt, cumin and balsamic vinegar. 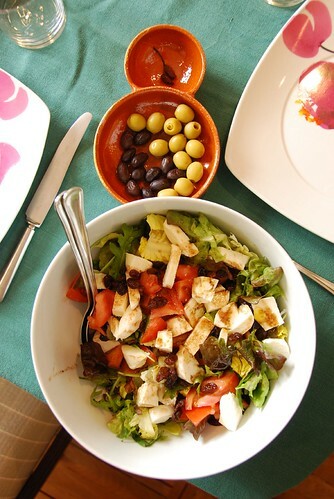 Ensalada de lechuga, oruga (rï¿½cola), tomate, pasas, mozzarella y aliï¿½o de aceite de oliva virgen, vinagre balsï¿½mico, sal Maldon y comino. 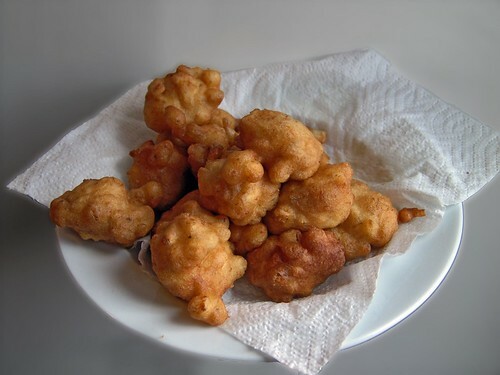 Fritteda de habitas tiernas y alcachofas. Restaurante italiano La taverna siciliana. 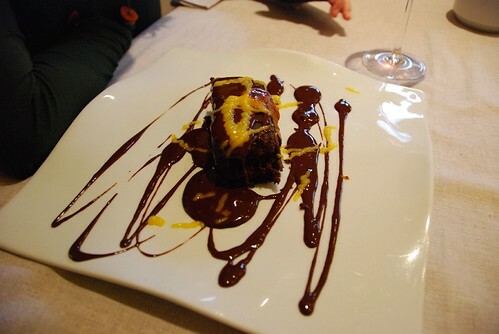 Spain: Dark chocolate cake with Sevilla orange sauce. Restaurante italiano Casa Marco, en Madrid, Espaï¿½a. 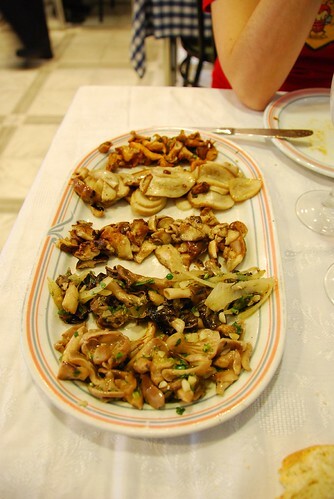 Panachï¿½ de setas: cantarelu, boletus, roble, colmenilla y otra que no recuerdo. Restaurante El Imperio, en Madrid. A nice homemade dinner to call it a day: olives, salad, cured Ibï¿½rico pork ham & loin, red wine, Spanish tortilla (omelette) and empanada (pie). Un buena cena casera para rematar el dï¿½a: aceitunas, ensalada, jamï¿½n y lomo ibï¿½rico, empanada, tortilla y vino tinto. 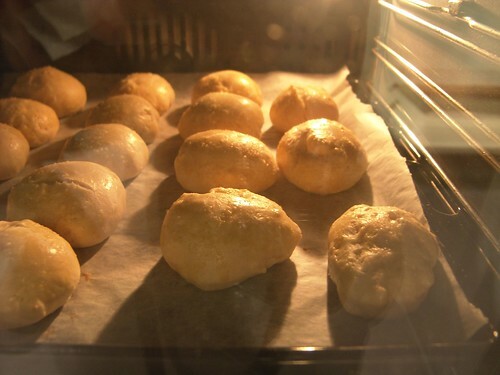 Homemade "medias noches" (buns) being baked. Unas medias noches en el horno de casa. It's rainy and windy and snowy. Home-cooking time. 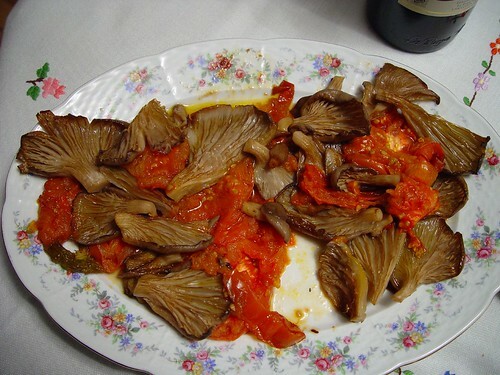 Buï¿½uelos de bacalao para un fin de semana lluvioso, ventoso y nevoso. Frï¿½o, vamos. 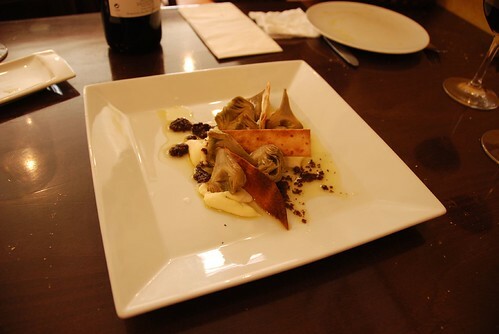 Alcachofas con queso y morcilla. Arroz integral, queso fresco empanado, coliflor con curry, y pastel de berenjenas. Restaurante vegetariano Artemisa, en Madrid, Espaï¿½a. Bolas de bacalao caseras, para completar el cocido murciano hecho por mi amigo Javier. 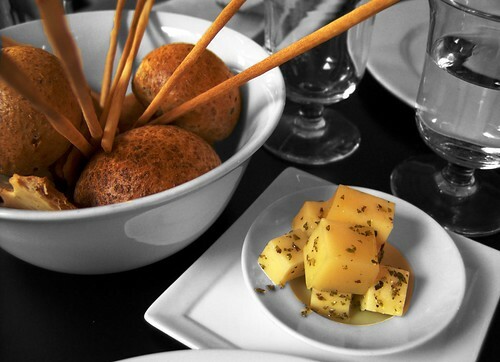 Madrid: Manchego cheese in olive oil, bread and grissini. Whole wheat bread, Italian bread and Manchego cheese soaked in virgin olive oil (and oregano). At the DL's restaurant in Madrid. You can download the menu here (in Spanish). This was yummy. Lots of cinnamon. 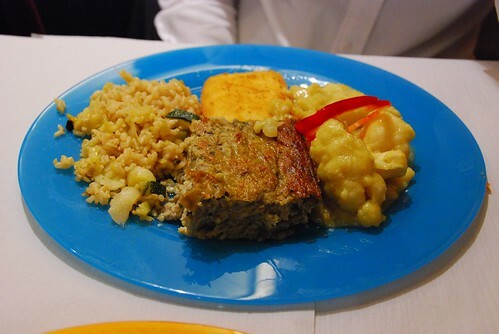 We finished this culinary day (slipper lobsters, sea urchin eggs...) with a Roscï¿½n de Reyes, a typical Spanish cake we usually eat on Epiphany Day (6th January). Para rematar el dï¿½a (santiaguiï¿½os, erizos...), Anusca hizo un roscï¿½n de Reyes. Varias horas de fermento, reposo y horneado. Typical Catalan desert. It is sweet custard with a hard caramel cover. I had a couple of these for breakfast. 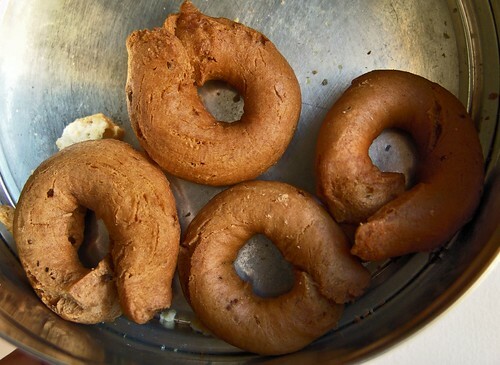 Rosquillas caseras. Me comï¿½ dos de estas para desayunar. Spain: Stew's soup. 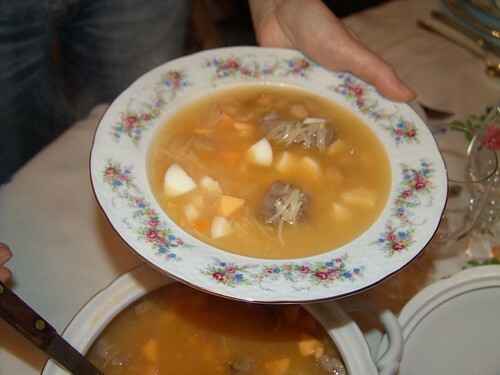 Sopa de cocido. 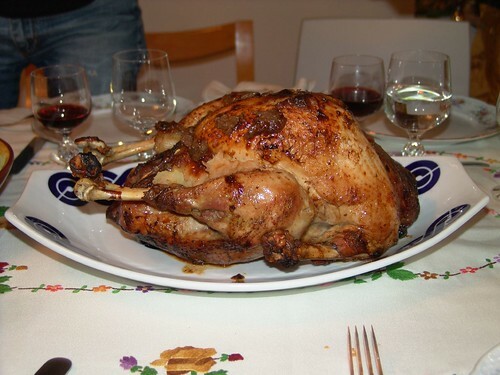 Spain: Roasted & stuffed turkey. Pavo asado y relleno. Christmas lunch. Stuffed with dried fruits and nuts. 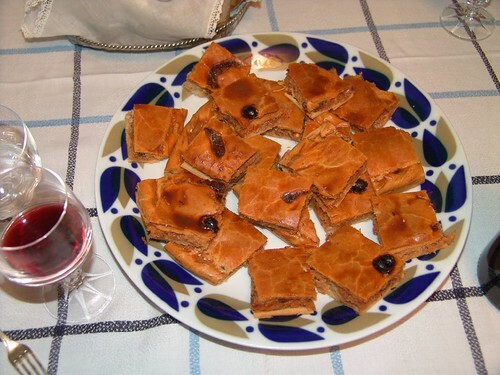 Spain: Galician pie. Empanada gallega. 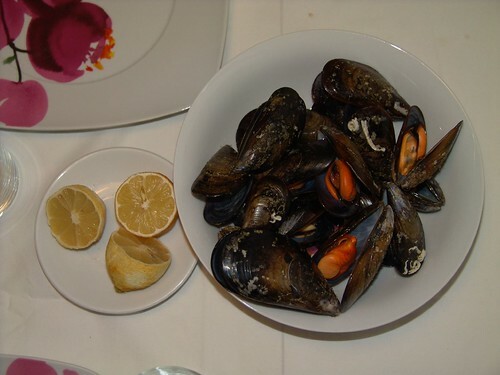 Spain: Steamed mussels. Mejillones al vapor. Just that, some mussels boiled in a little bit of salty water (vapour does the rest) with a bay leaf. Eat with a squiert of lemmon. Spain: Homemade crï¿½me caramel. 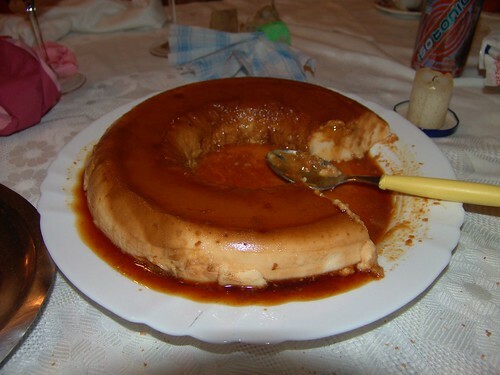 Flan casero. 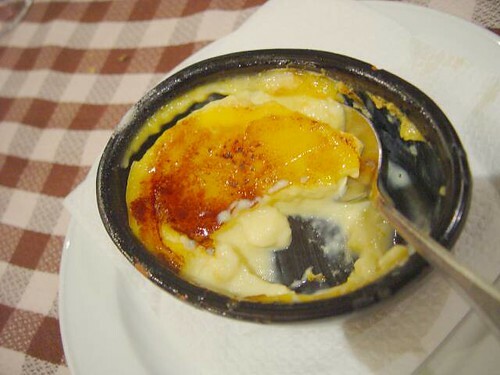 A typical Spanish dessert. My mom's. 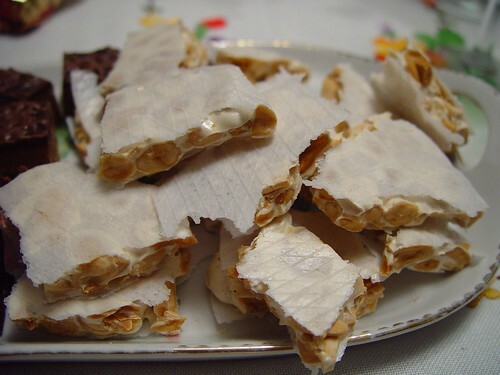 Spain: Spanish nougat ("turrï¿½n", typical Christmas dessert). Basically, different combinations of entire or minced almonds and honey. 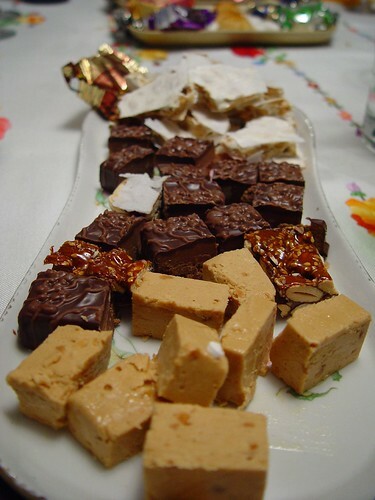 Spain: Spanish nougat ("turrï¿½n de Alicante"). 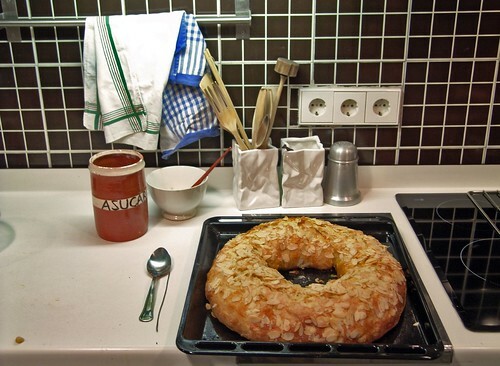 This one is called "Torta de Alicante". Whole almonds, a mix of churned honey and sugar, all bottom and top-covered with a thin wafer. 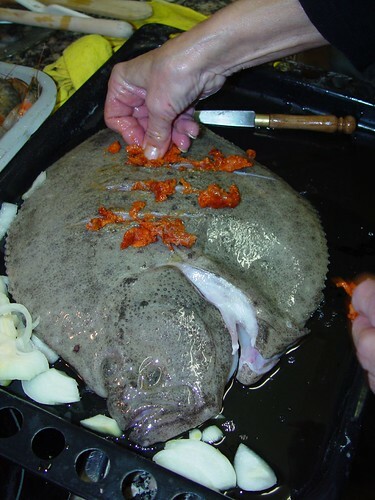 Spain: Mom stuffing a turbot with red peppers. 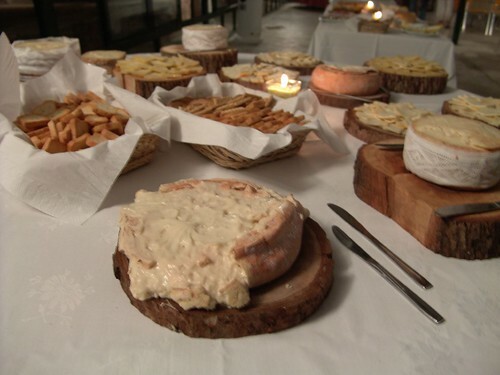 Spain: Five strong creamy cheeses from Extremadura (Spain). Five types of stinky Extremadura (Spain) cheeses. Spain: Sweet & Sour sea bass at Buen Gusto Chinese restaurant. Buen Gusto means "Good Taste". This restaurant is located in Madrid. The fish was fresh and tasty. Excelent. Lubina agridulce en restaurante Buen Gusto (Madrid). 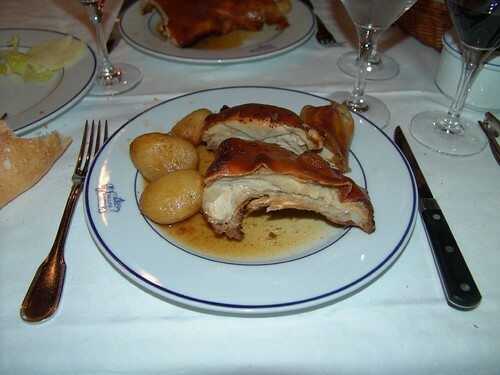 Spain: Roasted piglet at Casa Botï¿½n. Cochinillo en Casa Botï¿½n. 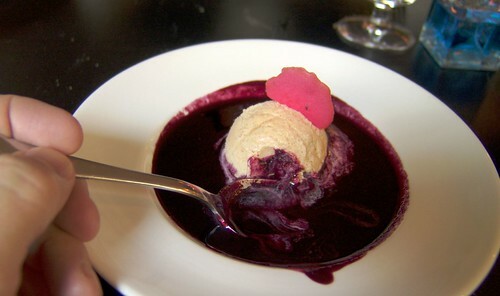 According to the Guiness World of Records, www.CasaBotin.com (Madrid) is the oldest restaurant in the world. Roasted piglet is one of their specialties. Spain: Galician wheat bread (Galicia, NW Spain). 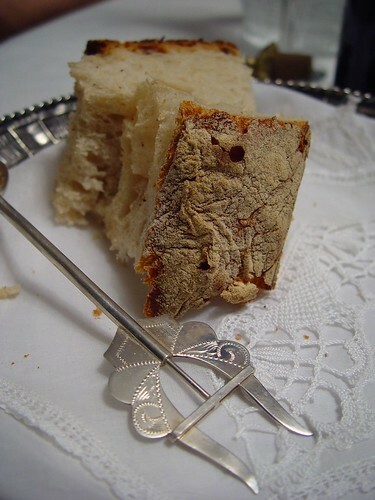 You can spear the bread with this silver bread fork and then push the top slider to drop it. 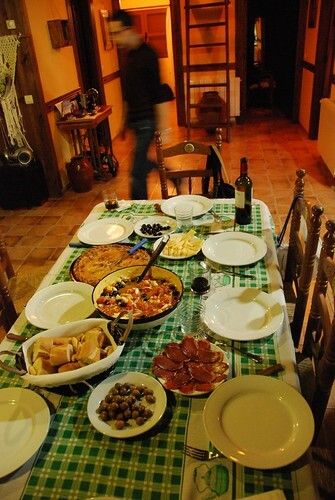 Spain: Spanish tapas. 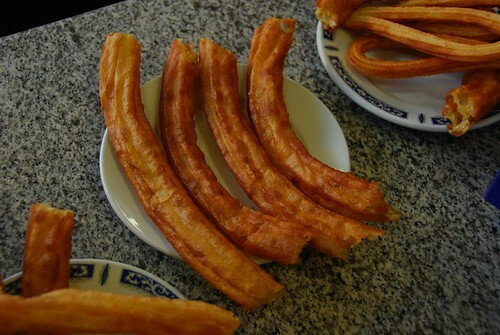 Tapas espaï¿½olas. 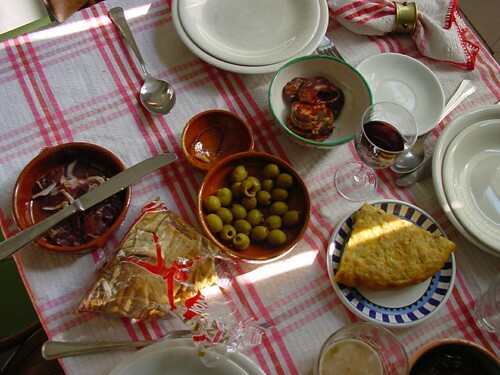 Red sausage, unleavened bread (cracker), olives, tortilla (potato and eggs), cured pork ham (jamï¿½n serrano) and red wine. 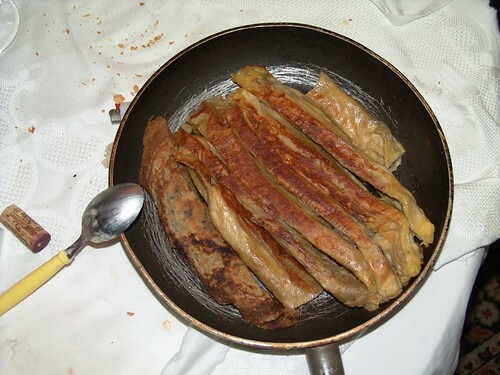 Spain: Stuffed filloas. 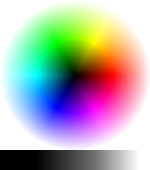 Galician crï¿½pes. You can find different versions of this dish (thicker, sweeter, more or less flour...) all around the world: filloa, frisuelo, tortita (Spain); panqueque (Argentina, Uruguay); pancakes (several countries); crï¿½pes, roti, etc. 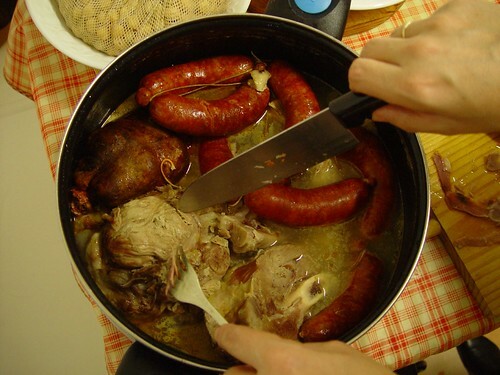 Spain: Galician stew: pork, garbanzo beans, sausage, veal, turnip greens and boiled potatos (Galicia). 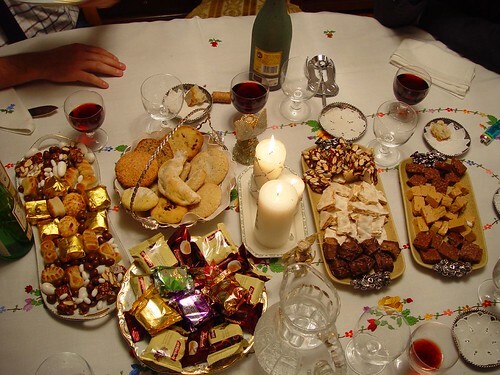 Spain: Spanish nougat ("turrï¿½n" and other typical Christmas desserts). 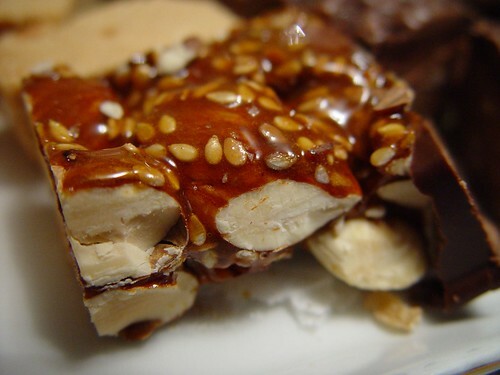 Search in my pictures using tags like turrï¿½n or nougat to see some explanations and ingredients.